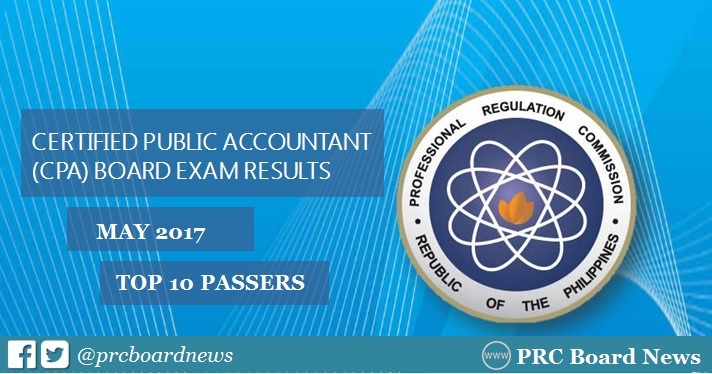 The May 2017 CPA board exam results or Certified Public Accountant full list of topnotchers (top 10 passers) are officially released online by the Professional Regulation Commission (PRC) on Monday, May 29, or in 5 working days after the exam. Vianca Pearl Inot Amores and Marianito Jesus Berdin Del Rio both from University of San Carlos (USC) topped the board exam with 92.67%. It was followed by Jessa Comar Bermudo, also from USC, obtaining 92.50%. In the same period last year, Karim Gonzales Abitago from Universal Colleges of Paranaque topped the 2,967 passers with 92.17% grade. It was followed by Kimjames Sarapanan Manalo from Cor Jesu College(Holy Cross of Digos). In the May 2015 exams, Eunice Millicent Ong Li of Chiang Kai Shek College, got the highest place, out of 2,132 passers, obtaining a grade of 92.29%. Shaun Anthony Tiu Go, alumnus of University of San Carlos ranked second with 91.29%. Here's a quick overview of previous examinations for CPA board exam.